The Lawrence University Conservatory of Music clinched an impressive list of awards this November, with major wins at opera and voice competitions. 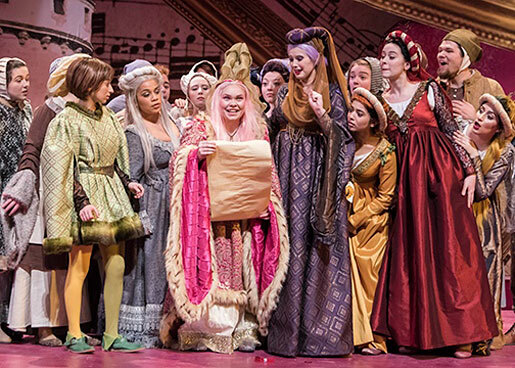 Lawrence University placed first in Division 4 of the National Opera Association’s Best Opera Production 2017-2018 for their production of The Count Ory. The French comedic opera by Rossini was staged in March under the instruction of Director of Opera Studies Copeland Woodruff. Opera studies also had a strong showing in the musical theater division of the Collegiate Opera Scenes Competition, making it to the finals. In addition to the impressive group performances, Jack Murphy ’21 of Neenah, Wis., and Nysios Poulakos ’21 of Iowa City, Iowa, will be competing at the NOA National Conference in Salt Lake City in the January in the musical theatre division, performing a scene from Duncan Sheik and Steven Slater’s Spring Awakening. In more exciting news for Lawrence opera, Anna Mosoriak ’19 of Highland, Ind., won a Metropolitan Opera National Council Encouragement Award. The MET Opera National Council is the most prestigious competition in the United States for young singers; the Encouragement Award is presented to singers who, though they do not advance to the next round of the competition, show promising talent. The list of accomplishments for the Conservatory continues, with 10 Lawrentians earning accolades in a huge showing at the annual Wisconsin Chapter of the National Association of Teachers and Singing (NATS) competition held Nov. 3-4 at UW-Whitewater. Kyree Allen ’22, Washington, D.C.: First place men’s first-year college classical division. Clover Austin-Muehleck ’19, San Francisco, Calif.: First place women’s fourth-year college classical division. Emily Austin ’21, Washington, D.C.: First place women’s third-year college classical division. Nick Fahrenkrug ’20, Davenport, Iowa: First place men’s third-year college classical division; this is Nick’s third straight NATS title. Alex Iglinski ’19, Muskego, Wis.: Second place men’s third and fourth-year musical theatre division. Hannah Jones ’22, Houston, Texas: First place women’s first-year college classical division. Baron Lam ’21, Galesburg, Ill.: Second place men’s second-year college classical division. Emma Milton ’21, Muskego, Wis.: Second place women’s second-year college classical division. Jack Murphy ’21: First place men’s first and second-year musical theater division and first place men’s second-year college classical division. Sarah Scofield ’21, West Lafayette, Ind. : First place women’s second-year college classical division. The NATS competition features 28 separate divisions grouped by gender and level. Depending upon the category, competitors are required to sing two, three or four classical pieces from different time periods with at least one selection sung in a foreign language. This year’s showing builds on Lawrence’s winning tradition at NATS; Lawrence singers have regularly taken first-place honors in a competition that draws hundreds of singers from around the state.